What's the most frustrating part of talking about all this high-power DX9 hardware? There are absolutely no games available that truly stress it; the market is waiting for the release of one very pivotal title, the game that will determine whether ATI or NVIDIA is crowned the true next-generation performance king: Doom3. We have been anxiously awaiting the release of a pre-release benchmark version of Doom3 for our graphics tests, and last Thursday we were given a unique opportunity to benchmark Doom3 on a number of the latest GPUs. The opportunity was put together by idSoftware and NVIDIA, and was very limited in nature, but it was something we had to jump on. We were given one evening with a system running Doom3, to test the latest GPUs from both ATI and NVIDIA using whatever drivers we pleased using whatever settings we would like. The only stipulation was that we could not comment on how the game looked, just on the performance of the GPUs. 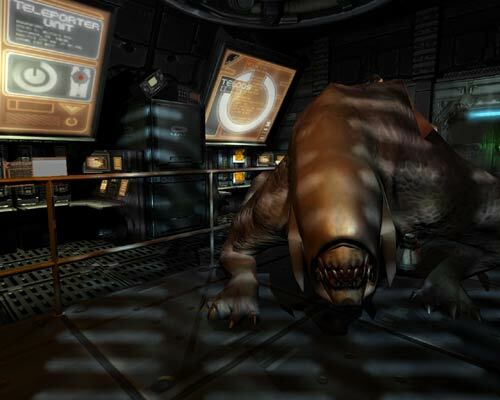 Doom3 is still a while away from shipping and thus we can understand id not wanting us to talk about the look of the game, and we gladly agreed to their terms in order to bring you a quick look at the performance of Doom3 on today's GPUs. Here are some words of forewarning though; for starters, neither ATI nor NVIDIA gave us Doom3 optimized drivers to test with, we tested using the same drivers we used in all of our other tests (both drivers will be publicly available next week from ATI and NVIDIA). We actually ended up using ATI's Catalyst 3.2 instead of 3.4 for our Doom3 tests simply because the Catalyst 3.4 drivers we had were significantly slower in Doom3 and were much more unstable than the 3.2 release. The only options that we could change in game were the quality settings which we could set to low, medium or high. We benchmarked medium and high, but on the fastest cards the performance drop in high quality mode was negligible so we stuck to reporting the medium detail level scores due to time constraints. id allowed us to publish a screenshot to give you an idea of the level of detail we're talking about with Doom3. The game is nothing short of impressive and makes the rest of our benchmark suite look extremely dated. We ran at 1024x768, 1280x1024 and 1600x1200 with AA/Aniso off as well as with 4X AA and 8X Quality Aniso enabled. You should be ashamed. The linking of words to completely unrelated MARKETING ADS is absolutely ridiculous...as if you don’t have ENOUGH ads already. I certainly found the article informative. I read the article with a view to making a decision on which card to purchase over the next week or so and to be honest the article said enough to convince me to sit tight. I also felt there is more to come from both ATI and nVidia and the results which are presented are perhaps not entirely complete. This is pointed out by Anand and at $499 I need to be making the right choice, however, Anand did succeed in convincing me to wait a tad longer. I think this is a great article with a few significant flaws in its benchmarking. Firstly, the Doom 3 numbers. Anand acknowledged that he could not get the 9800P 256MB to run the tech demo properly, yet he includes the numbers anyway. This strikes me as not only incorrect but irresponsible. People will see 9800P 256MB numbers and note that its extra memory makes no difference over its 128MB sibling, yet only if they read the article carefully would they know that the driver Anand used limits the 9800P 256MB to only 128MB, essentially crippling the card. Also, note the difference between Medium Quality and High Quality modes in Doom 3 is only anisotropic filtering (AF), which is enabled in HQ mode. Note that forcing AF in the video card's drivers, rather than via the application, will result in higher performance and potentially lower image quality! This was shown to be the case both in a TechReport article on 3DM03 ("3DMurk"), in forum discussions at B3D, and in an editorial at THG. Hopefully this will be explored fully once a Doom3 demo is released to the public, and we have more open benchmarking of this anticipated game. "The GeForceFX 5900 Ultra does extremely well in Quake III Arena, to the point where it is CPU/platform bound at 1600x1200 with 4X AA/8X Anisotropic filtering enabled." was left unchanged, even though it was based on what many assumed were erroneous benchmark data. I can only conclude that the data were indeed erroneous, as they have been removed from the article. Sadly, the accompanying text has not been edited to reflect that. Thirdly, the article initially tested Splinter Cell with AA, though the game does not perform correctly with it. The problem was that NVIDIA's drivers automatically disable AA if it's selected, yielding non-AA scores for what an unsupsecting reviewer believes is an AA mode. ATi's driver allow AA, warts and all, and thus produce appropriately dimished benchmark numbers, along with corresponding AA errors. The first step at correcting this mistake was to remove all Splinter Cell graphs and place a blurb in the driver section of the review blaming ATi for not disabling AA. Apparently a second step has been taking, expunging Splinter Cell from the article text altogether. Strangely, Splinter Cell is still listed in the article's drop-down menu as p. 25; clicking will bring you to the one last Quake 3 graph with the incorrect analysis, noted above. "What stood out the most about NVIDIA was how some of their best people could look us in the eye and say "we made a mistake" (in reference to NV30)." What stands out most to me is that NVIDIA still can't look people in the eye and say they made a mistake by cheating in 3DMark03. Recent articles have shown NVIDIA to be making questionable optimizations (that may be considered cheats in the context of a benchmark) in many games and benchmarks, yet I see only a handful of sites attempt to investigate these issues. ExtremeTech and B3D noted the 3DMark03 "optimizations." Digit-Life has noted CodeCreatures and UT2K3 benchmark "optimizations," and Beyond3D and AMDMB have presented pictorial evidence of what appears to be the reason for the benchmark gains. NVIDIA appears to currently foster a culture of cutting corners without the customer's (and, hopefully, reviewer's) knowledge, and they appear reticent to admit it at all. I realize this post comes off as harsh against both Anand and NVIDIA. In the initial comment thread on this article, I was gentler in my (IMO, constructive) criticism. As the thread wore on for weeks without a single change in the multiple errors perceived in the original article, I gradually became more curt in my requests for corrections. Anand elicits possibly the greatest benefit of the doubt of any online hardware reviewer I know, as I've read his site and enjoyed the mature and thoughtful personality he imbued it with for years. I'm sorry to say his response--rather, his lack of response, as it was only Evan and Kristopher, not Anand, that replied to the original article thread--was wholly unsatisfactory, and the much belated editing of the article into what you read today was unsatisfactory as well. I would have much preferred Anand(tech) left the original article intact and appended a cautionary note or corrected benchmarks and commentary, rather than simply cutting out some of the questionable figures and text. Consider this post a summation of the criticism posted in the original article thread. I thought they would be useful to put this article in context, and I hope they are taken as constructive, not destructive, criticism. The 5900 is no doubt a superior card to its predecessor. I also believe this article, in its current form, presents an incomplete picture of both the 5900U and its direct competition, ATi's 9800P 256MB. Hopefully the long chain of revelations and commentary sparked by and after this article will result not in hard feelings, but more educated, thorough, and informative reviews.